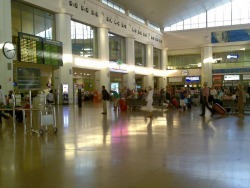 Málaga Airport (Aeropuerto Costa Del Sol) is large, modern and very busy (30 million passengers pass through a year). There are numerous carrier and route options available between the UK and Málaga. Check out Skyscanner for the best deals. Bus tickets are available to buy at the office on the left hand side as you exit arrivals. The new Terminal 3 train station links with Málaga city centre in one direction and the resorts of Torremolinos, Benalmádena and Fuengirola on the Costa del Sol in the other. From Malaga Renfe at Maria Zambrano Station, four stops from the airport, you can change for Madrid, Seville or Barcelona. Car hire desks are in the arrivals hall. If you can, a good trick to beat the summer time queues is to send someone ahead to sort out the car while you collect the luggage. Watch the variable speed limit when driving away from the airport if don’t want to get caught on camera. The journey to Granada is 125 km.